Thinking about taking take the leap from raising vegetables to raising things that run, jump, and poop? Read this first. Livestock make noises at odd hours and are known to slip out of fences and snack on neighboring rose gardens. Are you ready? Pigs, sheep, cows, and other large livestock aren’t suitable for the city and are typically outlawed by local laws. Goats are the largest animal we recommend if you don’t have at least an acre or two. Before bringing home farm animals, check with your local municipal planning department for the specific rules pertaining to each species, which vary dramatically from city to city. What Type: There are two broad categories: layers (eggs) and broilers (for meat). Modern breeds are generally bred to excel at one purpose or the other, though they all lay eggs and are edible. Many heritage breeds are considered “dual purpose,” however. Online hatcheries offer hundreds of breeds for overnight mail delivery (generally day-old chicks); choose based on egg productivity, growth rate, disease resistance, and appearance. Most folks aren’t up for the task of slaughtering their own birds, but in some areas, mobile abattoirs are available who will do the dirty work for a fee (where permitted by local regulations). How Many: The most prolific breeds lay five or more eggs per week in summer, tapering down to one or two in winter (unless you install artificial lighting in the coop to stimulate them). Estimate your family’s egg consumption and do the math to figure out how many birds you’ll need. Necessary Infrastructure: A dry, well-ventilated coop with a nesting box for each bird and a roosting bar for them all to sleep on at night; a chicken “run” enclosed with wire mesh (on both the sides and top) for scratching, foraging, and dust bathing. Care Routine: Letting the birds out of the coop at dawn and enclosing them up again at dusk each day; providing food and water and collecting eggs daily; cleaning out the coop weekly. Neighborly Considerations: Roosters are a no-no in the city, for obvious reasons; unless the hens are kept in a completely enclosed space at all times, you’ll need to clip their wings so they can’t fly over the fence and destroy your neighbor’s lettuce seedlings. What Type: Turkeys lay delicious eggs, but not nearly at the rate of chickens; thus, they are primarily a meat bird. Modern commercial breeds (there are only two: broad breasted white and broad breasted bronze) are best avoided for backyard farming purposes, as these birds are disease-prone and have trouble with basic bird functions, like walking. A number of heritage breeds, which differ little in meat quality, are available from online hatcheries. If you can’t find a mobile abattoir in your area, call around to local poultry processors to find one who will accept small batches. How Many: Plan on at least two, so they can keep each other company; that way you’ll have one for Thanksgiving and one for Christmas. If you want to stock your freezer with turkey to eat throughout the year, know that each bird will yield about 10 to 15 pounds of meat at maturity. Necessary Infrastructure: Same as for chickens, though you can skip the nest boxes. Care Routine: Same as for chickens, minus egg collection. Neighborly Considerations: Same as for chickens. 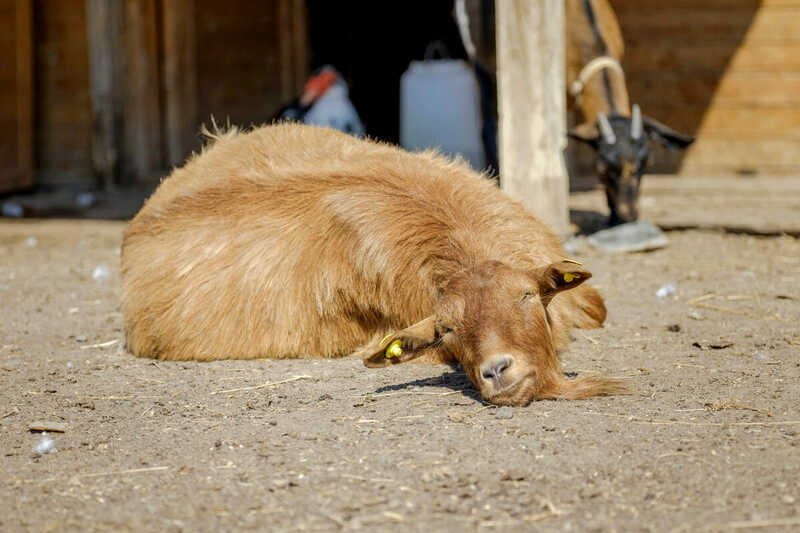 What Type: Meat goat breeds don’t produce much milk, so if dairy is your goal, stick with dairy breeds – they aren’t as beefy as the meat breeds, but they’re still perfectly good to eat. And you will eventually end up with extra goats that need to be eaten or sold, as the females won’t produce milk until after they’ve given birth. Dwarf breeds are highly recommended for urban areas, and are often the only type of goat permitted under local laws. How Many: These are highly social herd animals, so you’ll need at least two; most urban lots don’t have space for more than four or five. Two full-size dairy goats will provide enough milk for the average family, plus plenty left over for cheese- and yogurt-making. Necessary Infrastructure: Goats are content to dwell in a three-sided shed-like structure lined with fresh straw. They need an ample fenced area to frolic about in, and ideally a few large boulders or something else they can clamber around on. Care Routine: Feeding and milking are twice-a-day chores. Clean out their pen weekly and trim hooves every six weeks. Neighborly Considerations: Sturdy fencing (minimum 4 feet tall) is crucial, as goats are extremely curious and would love to explore your neighbor’s flower garden. Mature male goats are not suitable in the city – they’re smelly, big and aggressive – so you need to find a goat farm out in the country where you can take your girls to be bred each fall. What Type: Any rabbit is edible, but avoid breeds bred only for show purposes, as these will have less meat on the bone. Bunnies aren’t suitable for mail delivery like chicks and poults, so you’ll have to find a local breeder where you can pick up a few to start your rabbitry. How Many: You’ll need at least one male and one female to start, which will soon produce more offspring than a family can eat. Only allow them to breed when you’re getting low on rabbit in the freezer. Necessary Infrastructure: Rabbits take up very little space ”“ a tiny hutch and attached fenced area for them to scamper about in is all you need. Though you do need a separate hutch to house any males you plan to keep. Care Routine: In addition to letting the rabbits out of the hutch and into the run each morning and closing them up again before dark, providing food and water are the only daily chores; though you’ll need to clean out the hutch weekly. Neighborly Considerations: Rabbits are clean, quiet, and compared to most other livestock, easy to contain. Your neighbors will likely never know they are there. Hey I know this article is a little old, but this is exactly what I dream f doing. I’m wondering what practical ways a single person could handle having to go away. Say, a weekend for a national guard Soldier, or possibly up to a year for deployment. Or even just a 5-day beach vacation. Is it common to hire basically a “farm-sitter,” except for your animals, to include milking, egg collection, meat/pelt processing, freezing? Maybe some local farmers’ teenage kid? I want to start rabbit fram at chhattisgarh Koriya district.